I have a bit of a soft spot for upright italics, such as in Gill’s ‘Joanna’ typeface, I think it’s a shame there aren’t more around. Subconsciously the italics in my lettercutting work have gradually been uprighting themselves, I suppose this is why I wished to explore the concept further. I knew that upright italics existed so I wondered what would happen if I attempted a sans-serif version – skewing the forms upright, keeping the same high stroke contrast and snipping the serifs off. Obviously it’s not quite that simple, but I like the idea of designing something unconventional and attempting to make it blend in, having that feeling that something is different but you can’t quite put your finger on it. I thought I was embarking on a unique concept, I couldn’t seem to find anything quite following the same rules; until recently when I visited the MA Typeface Design open day at Reading University. Within the first ten minutes, as I browsed a fascinating exhibition of Gerard Ungers work, I came across his typeface ‘Flora’ and I quote ‘… it is also perhaps something quite unique. 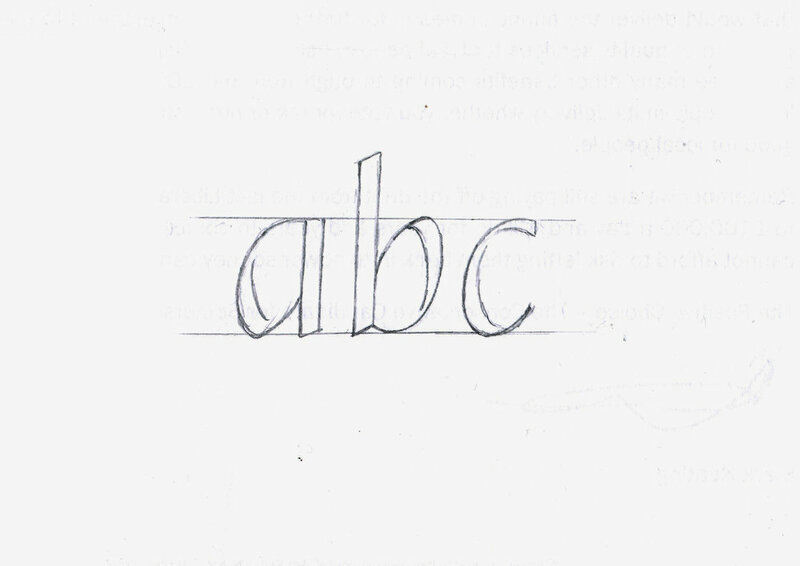 The design has been described as an “upright sans-serif cursive”…’ – turns out it was a unique concept 40 years ago. Really I knew there must have been something out there, and in fact more than anything seeing ‘Flora’ was uplifting and encouraging, I felt like it validated my thoughts and I feel inspired to continue working on this project.